Does a course about Children’s Literature sound fascinating? Or perhaps the Dog Behavior and Biology course interests you while you struggle to house train your own Spot or Fido? One of the many benefits of college is that you have the flexibility to choose what you want to learn. Electives allow you to be picky and select college courses that fulfill a general education requirement, help boost your GPA or interest you “just because.” Or they may give you the opportunity to explore new hobbies and develop desirable career skills and abilities. However, your elective choices can be limited, or even nonexistent, if you don’t have the right degree plan and make the wrong course decisions. It all depends on which credits successfully transfer, your degree requirements and what you ultimately want to do. Here’s what you need to know to ensure that you can take electives that meet your personal goals, passions and degree needs. 1. There’s no one size fits all. There are three different categories of electives you need to complete your degree: free electives, area of study electives and general education electives. Your degree program lists the credit distribution requirements you need to fulfill each type of elective and provide an overview of your options. Understand the difference so you can avoid taking a course that does not apply to your degree, or even worse, taking the same course twice. 2. Take electives after you have satisfied your required courses. First, complete your general education requirements, and then your general education electives. 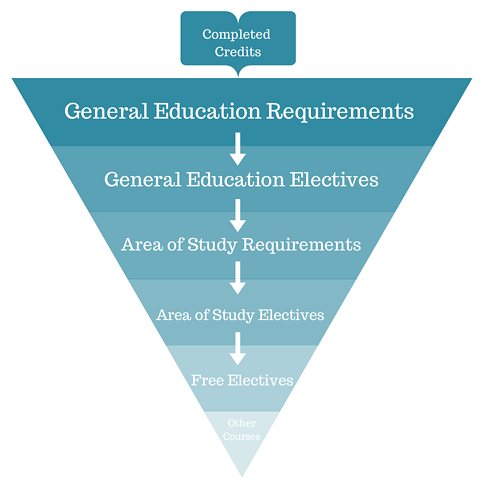 If you have transferred in a significant amount of credits or taken any exams for credit, (think English and math) a majority of those credits will most likely fall into the first and second tier (general education courses and electives). Once these have been satisfied, subsequent credits will attempt to fit into the next possible slot in your degree program. Then, complete your area of study requirements, followed by your area of study electives. Again, if you have transfer credits that satisfy these requirements, they will apply accordingly to your degree. Lastly, if any of your transfer credits do not fit into your general education and area of study requirements, they will apply as free electives. If your free electives have been filled, then credits will apply as other courses. Once all your degree requirements have been met, then you can take the electives you want, if you still have room to do so. 3. Take advantage of your interests and strengths. When you take a class that appeals to your interests and strengths, it typically contributes to a better learning experience. Also consider electives that will build or increase a specific skill set. For example, if you are pursuing a business degree, why not take a public speaking course? Developing your presentation skills would be a smart career move if you are pursing a leadership role in business. 4. Free electives are the most flexible. Free electives are courses that typically fall outside of your required courses and area of study, or are not needed under any other section of your academic evaluation. Any credits that are not required for your degree program will apply as free electives. Review your academic evaluation to find out how many more free electives (if any) you may still need to complete your degree. Then, you can take almost any course to earn those credits. Now, will it be American Cinema, Game Theory or something else? The choice is yours! 5. Area of study electives can enhance your selected field of study. You can choose these courses from a menu list of possible selections within your degree program. Use this opportunity to explore additional subjects and develop a well-rounded general knowledge of your area of study. For example, a communications degree candidate may decide to take courses in journalism, communication law and voice production to prepare for any number of career paths, further enhancing his/her experience and skills. 6. Consider area of study electives that focus on a specific discipline. Area of study electives can help you develop a deeper understanding of a specific subject area within your degree discipline. Here, you can choose electives that are relevant to your personal and professional goals. For example, a marketing degree candidate may choose to narrow down his/her degree focus to take only advertising courses to pursue an industry-specific career. 7. Consult your academic advisor before registering for any electives. Your academic advisor can help you understand the best options for completing your degree, so obtaining pre-approval before you register for any courses/credits is key. Getting classes pre-approved ensures that the credits you earn will apply to your degree program and will eliminate the possibility of duplicating a course you have already completed. Your academic advisor can also help you search and select courses at other regionally accredited institutions. This can be especially helpful when your degree program includes courses that are not offered at Thomas Edison State University. A quick email or phone call to your advisor for pre-approval can save you the time, money and hassle of taking a course that does not fulfill the credit you’re looking to earn. 8. You have more options for general education electives than you think. Understanding the Physical and Natural World. These courses can be used to satisfy requirements for more than one area, and can be tailored to your own needs and interests. Are you afraid of math? Then you can take Applied Liberal Arts Mathematics (intended for nonmath degrees) to fulfill your math requirement. Or are you looking to fill a Humanities course? Introduction to Photography could help you develop (pun intended) your photo-taking skills and fulfill your degree requirements. 9. General Education Electives can complement your degree. Think that taking a Managerial Communications to fulfill an Intellectual and Practical Skills requirement isn’t relevant to an information technology degree? Think again. An IT professional may supervise staff, negotiate with product vendors and develop company procedures - job responsibilities that require basic skills in effective communications. Basic general education electives enable you to take courses that not only strengthen your skills and abilities for future course work, but also foster the proficiencies employers most value in the workforce. Maybe you’ve taken an elective simply for fun. Or maybe an elective opened your eyes to a new career path. What fascinating or intriguing electives have you taken? Subscribe to the Thomas Edison State University Blog and get the latest updates delivered straight to your inbox.